During Chinese leader Xi Jinping’s official visit to Moscow, Chinese banks signed agreements on financing Russian projects. For their part, Russian companies are ready to increase gas supplies and deliver civilian Sukhoi SuperJet 100 aircraft to China. 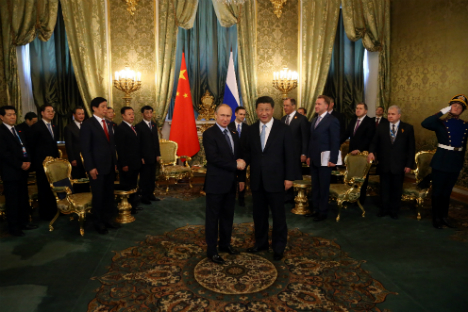 During Xi Jinping’s recent official visit to Moscow, Russian companies signed several major deals with their Chinese partners. Most of the agreements are designated in Russian rubles or Chinese yuan, according to RIA Novosti. “[Russia and China] intend to strengthen cooperation in the financial sphere, including through a wider use of the ruble and the yuan in mutual settlements,” Russian President Vladimir Putin said after the official meeting with his Chinese counterpart. He went on to add, “In the first two months of this year alone, the share of the national currencies in bilateral contracts exceeded 7 percent.” The signed agreements primarily concern Chinese banks’ funding for Russian projects. Analysts say this is particularly important given that Russian companies are denied access to Western capital markets because of the sanctions. Russian banks mainly received yuan loans from Chinese partners. The country’s largest bank, the state-owned Sberbank, opened a 6-billion-yuan ($966-million) credit line with the China Development Bank. The money will be spent on modernizing Russia’s biggest cement manufacturer, the Eurocement company. Russia’s second biggest state-owned bank, VTB, signed an agreement with the Export-Import Bank of China on a 3-billion-yuan ($483-million) credit line, whereas Russia’s main development institution, Vnesheconombank, received a 15-year loan from the same bank to the amount of 3.9 billion yuan ($628 million) for manufacturing special steel in Russia. Summing up the agreed Russian-Chinese projects, UFS IC chief analyst Ilya Balakirev highlighted the cooperation in energy, railways and aircraft manufacturing sectors. Gazprom Chief Executive Alexey Miller and Vice-President of China National Petroleum Corporation (CNPC) Wang Dongjin signed an agreement on the main terms for Russian gas supplies to China along “the western route”, the 2,700-km-long Altai gas pipeline. The contract envisages the supply of 30 billion cubic meters of gas over a period of 30 years. The cost of the project has not yet been finalized, however, in 2006 it was estimated at 363 billion rubles ($7.1 billion).